Home » Happening Now » Race week at TMS! Race week news here! FORT WORTH, Texas (October 24, 2016) – International film and television star Chuck Norris, known universally for his ageless machoism, will introduce the Chase for the NASCAR Sprint Cup Series drivers still vying for the series championship when they arrive Sunday, Nov. 6, for the AAA Texas 500 at Texas Motor Speedway. Norris will introduce the eight drivers still in contention for the championship – Jimmie Johnson, Kevin Harvick, Kyle Busch, Matt Kenseth, Denny Hamlin, Carl Edwards, Joey Logano and Kurt Busch – that will include a special twist during pre-race activities leading up to the AAA Texas 500 (1 p.m. CT, TV: NBC, Radio: PRN, Sirius XM, 95.9 fm The Ranch local). 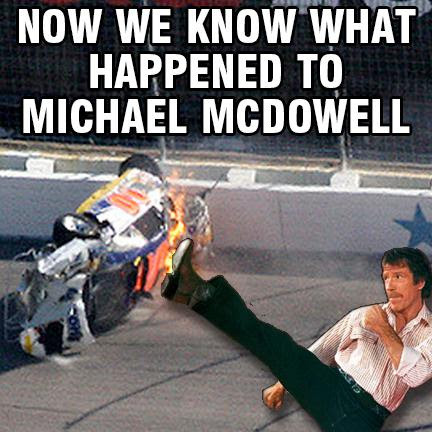 Norris has been immortalized for that machoism on the Internet through numerous memes known as “Chuck Norris Facts,” so it’s apropos that the martial arts legend will pay homage to the toughness of the Chase drivers with speedway-created memes for each of them. Each meme will follow his introduction of those eight Chase drivers and be shown on “Big Hoss,” the world’s largest TV, for the race fans in attendance. Texas Motor Speedway also will begin a week-long contest that will run today through Monday, Oct. 31, where fans can submit their own meme for any of the Round of 8 Chase drivers. The contest info will be available on all of the speedway’s social media platforms with a link to the meme album on its Facebook page for submissions. If a fan’s submission is selected, it will be featured on Big Hoss during the driver introductions and then printed, signed by Norris and mailed to the individual. He moved into acting and went on to star in 23 motion pictures, including “Delta Force,” Code of Silence, “Missing In Action,” “Breaker!, Breaker!,” and “Return of the Dragon.” He also starred in the CBS hit television series “Walker, Texas Ranger” for 8½ seasons and that syndicated show is now seen in more than 80 countries with an average of 1 billion viewers daily. Tickets for the AAA Texas 500 begin as low as $49 and are available by visitingwww.texasmotorspeedway.com or by calling the speedway ticket office at 817.215.8500. The AAA Texas 500 NASCAR tripleheader weekend also includes the Camping World Truck Series Longhorn 350 on Friday, Nov. 4, and the XFINITY Series O’Reilly Auto Parts Challenge on Saturday, Nov. 5. Graham Food Truck Championship this coming weekend!